EVENTS: TRIBAL CHIC 2015 IS BACK!! 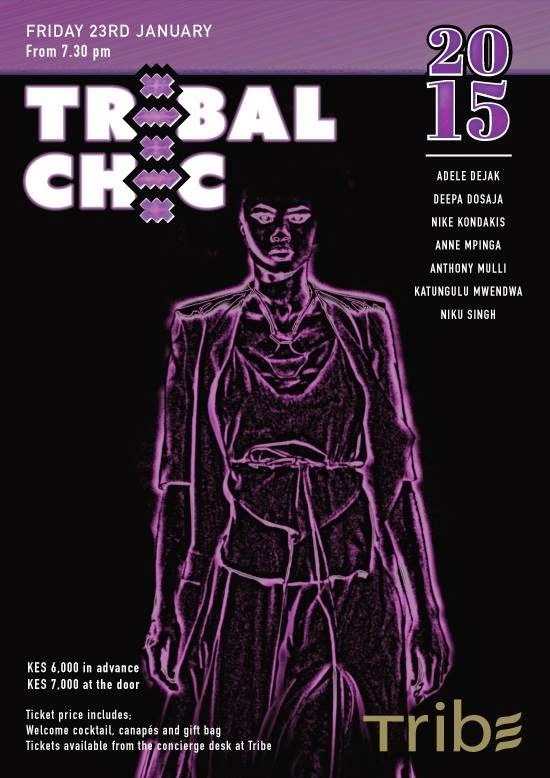 Tribe Hotel has always hosted Tribal Chic giving exposure to major designers across East Africa and It is back again this year on the 23rd January 2015 featuring Adele Dejak, Deepa Dosaja, Nike Kondakis, Anne Mpinga, Anthony Mulli, Katungulu Mwendwa and Niku Singh. All the proceeds for this years Tribal Chic go to FA254 which discovers and promotes new talent in order to re-brand Africa through young and creative minds. Their vision is to celebrate contemporary African riches and creativity. Tickets are available from the concierge desk at Tribe Hotel. Event starts from 7:30pm. Great your post>:) That is a very fantastic.Not long from now, Tribal Chic occurred on Friday 23 January 2015 facilitated by the Tribe Hotel, delivered by FA254 and exhibited by Susan Wong and Annabelle Onyango. The occasion offers presentation to significant originators inside Kenya as well as over the East African locale thus grasping the lodging's conviction, "One planet, One Tribe." With the glass lit catwalk, Tribal Chic was the first form occasion of the year and has unquestionably set the bar high. The returns went to FA254 whose mission is to find and advance new gifts keeping in mind the end goal to rebrand Africa through youthful and inventive personalities. Thanks all! !